Coconut is interesting in that it loosely fits the classification requirements of a fruit, a nut and a seed. According to the Library of Congress, however, a coconut is technically a drupe, or a pitted fruit that features a hard stone middle encasing a single seed. In raw form, a coconut has three layers that include the outer exocarp, the middle mesocarp and the inner endocarp layer. 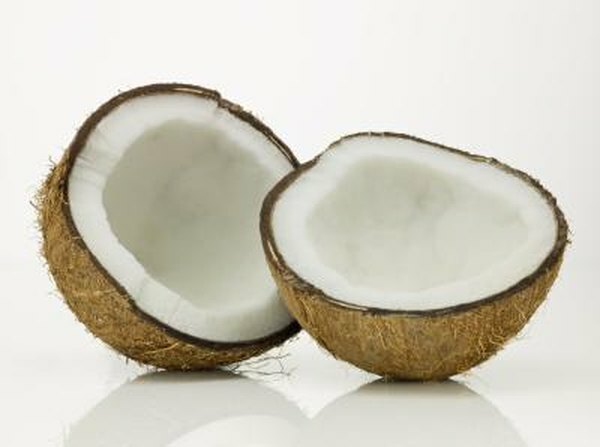 Although coconut has a high nutritional value, misconceptions concerning its saturated fat content may lead you to believe it can increase cholesterol levels. Although coconut itself is a cholesterol-free food, the saturated fat content in all forms of coconut is high, with 69 percent saturated fat in both dried and creamed forms and 24 percent in coconut milk. As Harvard School of Public Health notes, most saturated fats affect total blood cholesterol by raising the level of low-density lipoproteins, or bad, cholesterol, as well high-density lipoproteins, or good cholesterol. According to author and nutritionist Dr. Mary G. Enig, the molecular composition of saturated fat in coconut and coconut oil make it an exception to the general rule. The Coconut Research Center states that the fatty acid molecules in coconut are different due to the length of the carbon chain of each molecule. According to Nutrition Review, most saturated fats are long chain fatty acids containing 12 to 18 carbon atoms. Medium chain fatty acids are shorter, having only six to 10 carbon atoms. As Enig notes, coconut oil contain approximately 57 percent medium chain fatty acids, with 50 percent being lauric acid and 6 to 7 percent capric acid. Differences in size significantly affect how your body metabolizes long and medium chain fatty acids and determines the effect they have on cholesterol. Long chain fatty acids absorb into the bloodstream where they can have an immediate effect on blood cholesterol levels. The smaller, medium chain fatty acids, however, go directly to your liver where they become a source of quick energy rather than a factor in raising cholesterol. According to Bruce Fife, author of “Coconut Cures: Preventing and Treating Common Health Problems with Coconut,” coconut oil behaves more like a carbohydrate than a fat. In addition to the fatty acid composition of coconut and its effect on cholesterol, a study published in 2004 in the "Journal of Medicinal Food" showed a connection between the fiber contained in coconut flakes and a reduction in blood serum cholesterol. The study used coconut flour, a good source of both soluble and insoluble fiber and got results that showed a significant reduction in both total cholesterol levels and LDL cholesterol levels. Coconuts provide nutrition via meat, juice, milk and oil and are a good source of protein, fiber, vitamin C, thiamin and folate, and the minerals calcium, iron and phosphorous. Its high nutritional value, combined with numerous additional health benefits lead the Coconut Research Center to list coconut as a functional food, or a food that provides benefits beyond nutrition. Library of Congress: Everyday Mysteries: Is Coconut, a Fruit, Nut or Seed?